On mother’s Day, our grandson, Jake, was quietly bothered that there were no gifts for his grandpas. When we got up to leave, Jake ran to his room, grabbed a couple of his best diggers, hurried back down and gave them to his grandpas. It cost Jake a lot to give away two diggers. Jake loves his excavators, backhoes, and bulldozers. He treats them as if they are his children; he disciplines them when they act up, tucks them in at night, kisses and hugs them, and even plays with them. 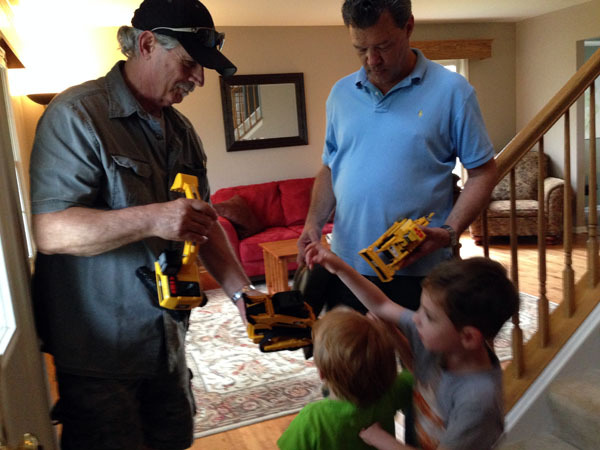 G-pa and Papa treasure their new diggers because these gifts reveal the heart of the giver: Jake gave away what he loves because he loves his grandpas and wants them to know it. G-pa and Papa didn’t ask for diggers, they probably asked for a hug or a kiss good-bye, but they got diggers. Jake gave away that which was valuable to him because he thought it was the right thing to do. God, however, doesn’t insist on our taking the gift of his Son. He lets us choose. He tells us the consequence of refusing: judgment; but the choice is ours. We can choose to receive or reject any gift God offers to us. God also allows us the freedom to ignore Him over the summer. We know the consequence: we lose intimacy with God; but the choice is ours. My challenge to you: spend time with God and receive the gifts that He is offering you this summer! And, while you’re at it, thank Him for all the gifts He has already given you. In order to do this well, you must think of all He has given you: Life, breath, love, salvation – and those are just the beginning. Determine to acknowledge that everything you have is a gift of grace; that you haven’t earned anything. Recognize that even the things you might think you’ve earned are in reality gifts from God. God has so many good and perfect gifts He wants to give you this summer, but you must be available to receive them. Will you come into His presence daily so that you can be surprised by the precious things He is waiting to give you? Awesome thoughts. We all have a tendency to put God on the backburner during the summer. HE IS OUR ONLY CONTINUING GIFT and our only way to heaven. Thank you for your gifts for the right words. Your messages make my day. Thank you for the sweet encouragement! I visited a church last Sunday . It was an awesome sermon about what are we doing as Christians in a world needing volunteers for the master. And yes this was a church we visited as part of our vacation. It may have been a little church in the north but the message was sent and dropped in our lap. And even though this is our summer, we can walk the talk.